Sadayavarman Sundara Pandyan I (?-1268) - The historical character with the longest name of this chart, he ruled as emperor of the Tamil Pādyan dynasty of Southern India from 1251 to 1268. 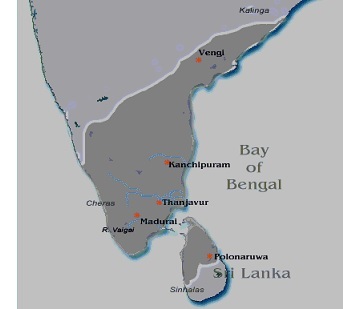 Recall earlier on this chart that the Chola dynasty was also a southern Tamil dynasty. The two vied for dominance of southern India for centuries. But by Sundara's time the Chola Empire was in steep decline and the Pādyan was on the rise. After 300 years as the subordinate kingdom, the Pādyan overtook the Chola as the more powerful of the two. Sundara expanded his empire by conquering the northern half of Ceylon (modern Sri Lanka) and as far north as the the city of Kanchipuram. He used the wealth he gained to cultivate the arts in Pādyan society. Much of it went toward building and refurbishing Hindu temples. It appears that after the wars of conquest ended, the empire settled into a peaceful state and economic growth resulted. Under Sundara's reign, the Pādyan Empire reached its zenith.